Sichuan Airlines Airbus A319 was forced to perform an extreme emergency landing in China after one of the cockpit’s windshields shattered, nearly sucking the co-pilot out of the plane at 32,000 feet. Flight 3U8633 took off from Chongqing city at 6:26 am on Monday and has managed to climb to 9,800 meters (32,150 feet) when a windshield on the right side of the cockpit was suddenly blown off, forcing an emergency landing at Chengdu Shuangliu International Airport at 7:42 am. "There was no warning sign. Suddenly, the windshield just cracked and made a loud bang. The next thing I know, my co-pilot had been sucked halfway out of the window," Captain Liu Chuanjian was quoted as saying by the Chengdu Economic Daily. The co-pilot and another crew member suffered minor injuries, considering the extent of the damage, China’s aviation authority said, without providing specifics on what might have caused the incident in the first place. The plane landed safely with all 119 passengers and nine crew members on board. While authorities continue to investigate the accident, Sichuan Airlines noted that the flight had experienced a “mechanical failure.” Prior to the emergency landing, Sichuan Airlines flight 3U8633 was bound for the Tibetan capital of Lhasa. Pictures of the plane posted by users of the Chinese social media platform Weibo showed damaged controls and the missing cockpit window. Footage recorded by the passengers also showed baggage falling from overhead lockers and oxygen masks popping out. “Everything in the cockpit was floating in the air. Most of the equipment malfunctioned ... and I couldn’t hear the radio. The plane was shaking so hard I could not read the gauges,” the captain added, according to Reuters. Monday's accident comes less than a month after a woman was killed in the Southwest Airline's plane engine explosion, which caused one of the passengers to be partially sucked out of the porthole. On May 3, anotther Southwest Airlines flight was forced to conduct an emergency landing after a cabin window pane cracked in mid-flight. The Ohio State Highway Patrol confirms a Cessna crashed in a field in Orrville. The couple inside suffered minor injuries. Authorities recover the remains of three people from the wreckage of a plane that crashed and sparked a 12-acre brush fire on a remote slope near Volcan Mountain, sheriff's officials said. Deputies discovered the bodies Sunday morning, but steep, treacherous terrain made it impossible to move the remains except by helicopter, and high winds prevented the sheriff's aircraft from reaching the remote canyon, San Diego County sheriff's Lt. Greg Rylaarsdam said. The remains of the crash victims were removed from the mountain Monday around midday, a sheriff's official told FOX 5. The treacherous terrain made the recovery extremely challenging. Rylaarsdam likened reaching it by foot as "hiking almost down the face of a cliff." Making matters worse, the ground was still hot over the weekend from the fire that was apparently sparked by the crash, Rylaarsdam said. The ground was so hot, in fact, that firefighters warned sheriff's deputies Saturday that their ropes and boots would melt if they tried hiking to the aircraft wreckage. On Sunday, still wary of using climbing ropes, Cal Fire crews laid down dry hose lines that deputies were able to use to climb down to the crash site, the lieutenant said. The impact of the crash resulted in a wreckage site consisting of a debris field, but not an intact plane. The sheriff's department will turn the remains over to the San Diego County Medical Examiner's Office to officially identify them and notify their families. Officials assume, but have not yet confirmed, that the crashed plane was a 1979 twin-engine Beechcraft Duchess that was registered at El Cajon's Gillespie Field to the Scandanavian Aviation Academy. That plane was a four-seater. That plane was due to land at Ramona Airport on Thursday night but never showed up. Instead, a Julian resident reported seeing a plane crash near Volcan Mountain around 8:30 p.m. Thursday. Less than 30 minutes later, authorities got word of a small brush fire in the same area. A contractor with the National Transportation Safety Board was at the crash site Monday morning, Rylaarsdam said. The NTSB is responsible for identifying the plane and investigating the crash. The sheriff's lieutenant said he hoped there were large enough pieces of the plane left intact for the contractor to positively identify the wreckage. Officials believe the crash sparked the brush fire, dubbed the Volcan Fire. The blaze was 100 percent contained as of Monday morning, but Cal Fire San Diego crews expected to be at the scene at least until midweek mopping it up and monitoring for hot spots, spokesman Isaac Sanchez said. Just after 1 pm a fixed wing multi-engine general aviation plane (N99GN) crashed while landing at the Porter County Regional Airport in Valparaiso, IN. There were two passengers onboard the plane, one instructor and one student. They were both taken to the hospital, though they are reporting at least one passenger had a head injury. They were flying from Griffith, IN to Porter County Regional Airport. A woman died and a man was airlifted after a plane crashed in Jacksonville on Saturday. The plane was found in a wooded area off Whites Gap Road and Scott Lane. The woman who died is the daughter of the pilot. The woman has been identified as 27-year-old Stefanie Fasselin of Peachtree City, Georgia. Officials say she is the daughter of the pilot of the plane, who was transported to a Huntsville hospital for treatment. No word on his condition. The FAA says the Beech BE-35 aircraft collided with a tree and caught fire around 8 p.m. The NTSB investigator is on scene this afternoon examining the wrecking and documenting the scene. We're told there's no time table for the fact-gathering stage due to the wreck happening in a remote area. It could take 12-18 months for a final report, but we're told a preliminary report could be released by the end of this week or early next. A Boeing 737 has crashed after takeoff from José Martí International Airport in Havana. The plane belongs to Cubana de Aviación and was reportedly carrying over 100 on board. The plane reportedly crashed shortly after takeoff. It was bound for Holguin, a domestic flight of about one hour and 20 minutes. Cuban President Miguel Diaz-Canel, who arrived at the scene, has said that there are "a high number of victims," reported AFP. In a picture supposedly taken from inside the airport, a plume of black smoke can be seen rising from the end of a runway, as firefighters responded to the incident. 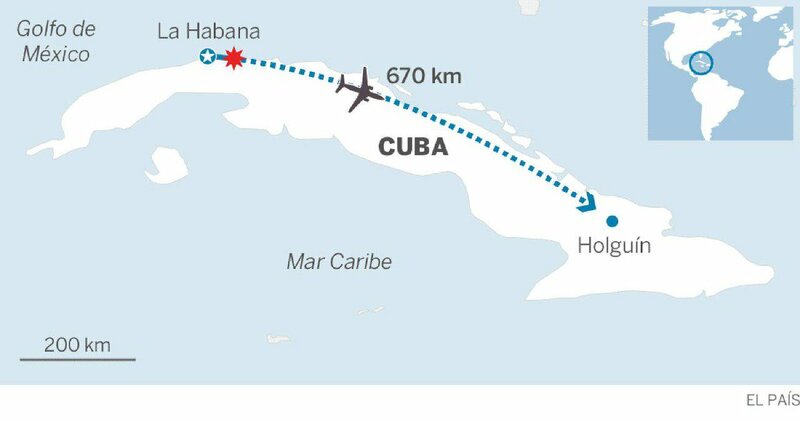 According to state media, the jet was leased by Cuba’s national airline, Cubana de Aviación, and flown by a foreign crew. I just read about this plane crash in the news, too. Thanks for Posting, C.a. Did you notice - another plane crashing "just after take off"? I wonder, if there has been a change and lowering in wind current - like it's riding closer to the earth's surface? Just two days ago, here in Pennsylvania, we got hit with a rain storm that picked up speeds close to a Tornado, actually Central Pa. did report one. The storm started out as heavy wind, then large rain drops that turned into ice pellets, then back to heavy rain. But the wind was like someone had turned on a blasting machine. There are countless and wide area reports of trees being up-rooted and roofs of homes being torn off. Last February, our area suffered much of the same, along with heavy snow fall. Trees were knocked down - all over the place. Most of our National Recreations Parks and campgrounds in our area are closed due to storm damage in the last 2-3 months. The main problem in recent storms is the straight line winds with speeds as high as 75 - 100 miles per hour. I wonder, do some of these planes get caught in straight line winds - taking off or coming in for a landing? Video taken by the park officials shows the strong wind brought in by Tuesday`s violent storm, which downed trees, poles and wires throughout the 60 miles of parkland. Finkle says even trails that were open had debris. Park officials say while this week's storm did leave a lot of damage it was actually two snow storms in early March that took a toll on some popular attractions. Park officials say some attractions will be closed for the rest of the year due to that winter storm. WAYMART, Pa. -- The National Weather Service confirmed an EF1 tornado touched down in Wayne County on Tuesday. A team from the National Weather Service started its investigation in Waymart Wednesday morning, checking out miles of destruction. Wertz showed us all the destruction from what the NWS preliminarily called an EF1 tornado with winds up to 110 miles per hour. (Menrva) I wanted to ask about Ferguson, Missouri. We wanted to know if the events there were a marker? A: Not a marker per se, it was an opportunity. Q: (Perceval) It was an opportunity for people to wake up, see what's going on, and take action. But they didn't. It was a missed opportunity by the people. A: The killing will continue until even the "silent majority" find their voice. They were silent at the exposure of Ferguson and many previous incidents. But notice that the anger is still building and psychopaths always miscalculate. Q: (Pierre) That's a message of hope. There will be a reaction eventually. (Perceval) And that's what they can't budget for because they're psychopaths. All of these shootings by cops are the result of the ponerization of America and the influx of psychopaths into society and into positions of power; more ordinary psychopaths, the only place they can get power is the police force; so, they flood the police forces because they're not smart enough to be politicians. Then they get guns and start shooting people. That's not part of their plan. I mean, I don't think they're trying to incite revolution by killing people. It's just a function of psychopaths in the police force doing what they do. It's going to be a war between them and ordinary people. (Andromeda) It'll be like in V for Vendetta. A: Psychopaths see these events as reasons to impose more controls, but that only results in more pressure and more anger which will reach a global tipping point. Q: (Pierre) Doesn't it mean national or international revolt? A: "Tipping points" can be other than human initiated actions. (Chu) But that makes sense like with dictatorships where people were oppressed and killed in front of other people, and still the people submitted. If it's not a cosmic type of reaction, people won't react now. They just don't have it in them. (L) Yeah, I think the big key to what's going on here is the global nature of the repression, the killing, the suppression, you know? (Perceval) …it manifests externally. It was a wave of creativity that was being suppressed, and it was a wave that came in and destroyed everything, you know what I mean? (L) That's a positive feedback loop of negative events. (Pierre) Yeah, you're right. More earth events, more desperation, more control, more anger, and it keeps feeding itself. I have to admit, my heart skipped a couple beats - watching those planes - trying to land! So, maybe some of these planes are hitting cross winds and down drafts - that send them in a downward spiral, with the pilots losing control? Four passengers, a man and three women, were said to survive the accident. The man died of his injuries soon after he was rescued from under the debris. The Boeing 737-200 was leased by Cubana de Aviacion from the Mexico-based Aerolineas Damojh for a domestic flight to the eastern Cuban city of Holguin. Mexico’s airline said there were 104 mostly Cuban passengers and six Mexican crew on board. Five passengers were foreigners. The Argentine Foreign Ministry said two of its nationals had died in the crash. The 39-year-old jet came down in the early afternoon in a field just outside the international airport. Witnesses told the state Granma newspaper it had veered to one side before striking a power line. The three women were taken to a Havana hospital with burns and fractures and are in a critical condition. They are reportedly in intensive care. Cuba TV initially said one of them died, but then withdrew the report. A flight engineer on another Cubana airliner that took off from Havana airport 13 minutes before the crashed plane told Cubadebate a technical fault had mostly likely caused the accident. Cuba’s former leader Raul Castro said he was following the incident and sent condolences to the victims’ families, according to the publication. Local media said he was still recovering from a recent hernia surgery. Russia, Mexico, Spain, Venezuela, Bolivia, Canada, the United States and others offered Cuba their condolences, saying they stood in solidarity with those bereaved. Russia’s President Vladimir Putin wished a speedy recovery to the survivors. Russian President Vladimir Putin sent a telegram of condolences to Cuban leader Miguel Díaz-Canel Bermúdez, over a deadly crash of a passenger jet in Havana airport, the Kremlin said in a statement Friday. Russian Foreign Minister Sergey Lavrov is expected to pay an official visit to Cuba on May 22, the Cuban Foreign Ministry said on Twitter. Cuba has confirmed that 110 passengers and crew that were onboard the Boeing 737-200 plane that crashed Friday shortly after takeoff from Havana airport died, state-run media reported. A Cuban airliner with 110 people onboard fell to the ground and burned on Friday. Four passengers, a man and three women, were earlier said to have survived the accident. The man died of his injuries soon after he was rescued from under the debris. There were five children reported among the deceased in the crash, Reuters said. The three women who survived the Friday crash of Boeing 737, which took off from Havana, are stable, but their lives are still under threat, the head of the hospital on Cuba where they are being treated, Carlos Alberto Martinez, said on Saturday. "In terms of hemodynamics, they are stable, but the threat to their life still exists because of the worsening of the serious injuries they sustained. They need significant medical treatment," Martinez said on the CubaTV broadcaster. The head of the hospital explained that the blood flow control in all three survivors had improved after surgery, adding that the fourth victim brought to the hospital after the crash had since died. A Sputnik correspondent confirmed after visiting the hospital that the three women were in the intensive care unit of Calixto Garcia hospital. Two pilots were able to eject safely when their Air Force T-38C Talon II supersonic jet trainer crashed in the US state of Mississippi, Columbus Air Force Base said in a statement on Wednesday. "An Air Force T-38C Talon II crashed at about 8:30 a.m. [12:30 p.m. GMT] today in a remote area near Columbus Air Force Base, Mississippi. Both pilots ejected from the aircraft safely," the statement on the Base's Facebook page reads. Both pilots were taken to the hospital for evaluation, according to the statement. No further details have been immediately available, however, a US journalist published what is believed to be the pictures of the crash site. The airbase has yet to reveal the reason for the crash. The Northrop T-38 Talon was the world's first supersonic trainer in service for over 50 years in the US Air Force, which is also the most produced one. It remains in service as of 2018 in several air forces, with the USAF operating the most of them. It has been also used by NASA. The Brazilian Air Force said on Thursday that one of its F-5F fighter aircraft had crashed near the Santa Cruz air base, located in the Rio de Janeiro metropolitan area. "The F-5F fighter jet of the Brazilian Air Force crashed at 07:40 a.m. [10:40 GMT] on May 24 after it had taken off [the Santa Cruz base] in Rio de Janeiro. The pilots managed to eject from the aircraft," the Air Force said on Twitter. DRAMATIC footage has emerged of the crash landing of a Saudi Arabian Airlines jet in which 50 people were injured after the plane was forced to come down without its landing gear. A SAUDI Arabian Airlines Airbus A330 jet made an emergency landing in the western Red Sea city of Jeddah, injuring 53 people, aviation officials said. The Saudi aircraft was travelling from the Muslim holy city of Medina to Dhaka with 151 people on board, but had to be diverted to Jeddah after it suffered a malfunction in the hydraulic system, the kingdom’s Aviation Investigation Bureau said. The plane suffered a malfunction of its landing gear and the captain was forced to land with the nose gear retracted after circling the airport for several hours to exhaust much of its fuel supply and after making two low passes. Footage posted online showed the plane leaving a trail of dramatic flame along the runway as it skidded on its nose before screeching to a halt. According to reports the plane suffered significant damage to its nose and underside. Emergency services were placed on standby and evacuated the plane shortly after the emergency landing. “The pilot made several attempts but failed to correct the malfunction with the front landing gear. Subsequently, the Airbus 330 made an emergency landing with the nose gear retracted,” Abdurahman Al Tayyib, a spokesman for Saudia Airline quoted as saying by Al Madinah daily on Tuesday, local time. Authorities say two people were killed after their plane crashed near a Petaluma airport Sunday afternoon. Allen Kenitzer, with the FAA Communications Office, said the aircraft was trying to land when it crashed 1,000 yards east of the Petaluma Municipal Airport. Kenitzer said two people were on board the plane at the time of the crash. Authorities haven't released information on the identity of the victims. with LFC fans around 1330, Bravo Airways MD-80 UR-COC operating flight BAY3002 taxiied out to runway 09 and was cleared to line up and wait while release from Scottish was obtained, for some unknown reason the pilots began the takeoff roll applying full power and beginning to accelerate WITHOUT takeoff clearance. Kudos to the controllers who were quick to realise and ordered the MD-83 to stop and abort takeoff, luckily the pilots understood this instruction and quickly idled the throttles and brought the aircraft to a stop abeam taxiway Delta. When the aircraft was eventually cleared for takeoff the pilots applied thrust, held the brakes then applied TOGA making for an epic departure! Can't say I ever thought anything like this would happen, especially with an aircraft as rare as the MD-83! OE-LQW operating flight U21977 as EZY34MN departed 23L just after 17:45 on it's way down to Corfu. The aircraft climbed to 9000 feet before leveling off, making one lap of the hold over the Trent (TNT) VOR before making a landing on 23R, the aircraft never squawked 7700 but tower referred to the A319 as an 'Emergency Aircraft'. After landing on 23R they vacated at the end where they were met by fire services where the brakes were inspected. After the go ahead from the Fire Chief they taxiied back to stand. Apparently the return was due to a pressurization problem. Massive respect to all involved for handling the situation the way they did! Eagle Harbor crash - UPDATE: Plane reportedly a 1974 4-cycle two-seater fixed wing single engine. Female originally taken to Eagle Harbor, where she was then transported to Harborview Medical Center. Second person, male, still missing. Confirmed only two people aboard at time of crash. A small plane crashed in Eagle Harbor on Sunday near the Bainbridge Island ferry terminal. Two people were onboard the plane when it crashed. A 60-year-old woman was rescued and transported to Harborview Medical Center, where she is in critical condition. A 70-year-old man remains missing, according to the Coast Guard. The plane was reported down after 5 p.m. Sunday. The Coast Guard identifies the aircraft as a '4-cycle, two-seater, single engine' plane built in 1974. The Coast Guard launched a rescue helicopter from Port Angeles and a boat crew from Station Seattle to aid in the search. The Seattle Fire Department also sent a crew to assist local agencies. The Federal Aviation Administration and National Transportation Safety Board will continue the investigation. As a kid, Pat Napolitano of Clovis had always dreamed of flying a Beechcraft Staggerwing aircraft. At 53, he had lived most of his life doing exactly that. "Queenie," as his Beechcraft Model D aircraft was known, was his to fly. Napolitano was flying Queenie home from Kansas on Friday when the plane suddenly vanished from air-traffic control radar over New Mexico. The Santa Fe New Mexican reported Sunday that an aircraft went down Friday near Ribera, a small town west of Santa Fe, killing the pilot. He had not yet been identified. But Napolitano's friends said Monday they know it was him. Napolitano was on his way to Chandler Executive Airport from Wichita, Kansas, where the plane that crashed was registered to a business. Morris Garcia, president of the Central Valley Aviation Association, said Queenie was owned by Mid-Continent Instruments and Avionics in Wichita. Napolitano was a sales manager for the company, according to Garcia, and flew the airplane for the business to meet with customers. Calls to Mid-Continent's office Monday were not returned due to the Memorial Day holiday. Garcia said Napolitano had a wife and a daughter, who live in Clovis. Garcia had known Napolitano for five years. Garcia has been flying airplanes for 63 years while Napolitano spent 33 years as a pilot, Garcia said. Queenie, the single-engine plane with space for five built in the early 1940s, was flown by Napolitano about 20 to 30 weeks per year, according to information provided by Garcia. He remembered Monday that Napolitano would often send him images from his flights, like sunsets, mountains and restaurants where he ate during his stops. "He was just a great guy," Garcia recalled. "Pat was a bigger-than-life type of fellow who would go the extra mile to help anyone." There are few clues as to how or why Napolitano's aircraft went down. The National Transporatation Safety Board and the Federal Aviation Association are believed to be investigating the accident. Garcia said a review of the tracking data made it appear that Napolitano had a "controlled descent" from about 10,000 feet. Garcia said Napolitano was known for his cautious aviation habits and, as a board member of the aviation association in Fresno, he promoted those practices to local pilots. A training aircraft of the Iranian army crashed in the suburbs of the Iranian capital of Tehran, the army's press service said Wednesday. The incident took place on Tuesday evening in uninhibited area not far from the Imam Khomeini International Airport, the statement read. According to spokesperson for Iran’s emergency agency Miztaba Khalidi, as a result of the incident two crew members were killed and one was injured. Initial reports stated that six people were on board of the airplane before it crashed, according to Iranian ISNA news agency. The army specified in its statement that the crash was caused due to a technical problem. A small plane crashed in New York's Long Island Wednesday, killing the pilot, according to local media reports. The plane, which was part of the Geico Skytypers Airshow team, crashed in Suffolk County along Northcote Drive in Melville at around 1:52 p.m. local time, ABC 7 reported. Photos of the wreckage were shared on social media by Long Island resident Lauren Peller. The SNJ-2 plane crashed right in front of her home. According to the New York Post, the "propeller-type" plane broke into several pieces before crashing in a residential area. Though many trees were knocked down, the plane did not hit any houses. The pilot, who has not yet been identified, was the only person inside the aircraft. No one on the ground was injured. "It's extremely lucky that nothing was hit," David Kaplan, first assistant chief of Melville, said. "Houses were approximately 200 feet away." The blaze that was ignited by the crash was put out in roughly 10 minutes by the Melville Fire Rescue. The Geico Skytypers Airshow Team is a flight squadron of six vintage WWII planes performing precision flight maneuvers at air shows, according to the team's website. A Cessna Caravan airplane operated by the WFP-run United Nations Humanitarian Air Service (UNHAS) was involved in an accident today on take-off from a remote airstrip in Kamonia in the Kasai region of the Democratic Republic of Congo (DRC). The Boeing 727-200F bounced after a hard landing at Bogotá-Eldorado Airport, Colombia. On touchdown the nosegear bogie separated from the gear leg. These were the incredible scenes as a pilot walked away with just a minor cut to his hand after crash landing his plane in the middle of a busy motorway. Eyewitnesses who filmed from their cars as the plane glided overhead also rushed to help after the plane came down on the I90 close to the Idaho/Montana state line in the USA. One man who filmed the crash explained: "I notice what looked to be a glider flying low over the freeway. "I thought this was odd as I've never seen a glider in this area before. I continued to follow the plane it continued to go lower and lower." Once it crashed, he along with other motorist rushed over to help the pilot and called the emergency service. Tim Halbert, another one of the first people on the scene, said he waited with the pilot for emergency responders. He said the pilot was experiencing some back pain and had a few bumps and bruises but walked away from the crash. "A sheriff's deputy that was there told him to go buy a lottery ticket," Mr Halbert said. He said the pilot told him he had caught a downdraft and his engine quit. He added that the pilot said he couldn't get the engine going again and glided for a long while looking for a place to put the plane down. "I knew he was in trouble because he was so low," Mr Halbert added. "He just kept getting lower and lower and sure enough, he just crashed." Mineral County Sheriff’s Office confirmed they were responding to the incident, but did not have any further detail. The pilot was taken to hospital to be checked over.